Doyle has worked with files of the Guatemalan National Police Archives in a recent trial against officers who perpetrated violence and government repression against activists during the 36-year internal conflict that ended in 1996. The Peace Archives comprise of documentation that provided material for this trial, inter alia. Specifically, the archives house government files from the civil war. The archives were just conceived in 2008, preceding an access to information law passed the same year. The FOI law was intended to create openness and government transparency. This recent announcement to dismantle the archives is a step back for human rights defenders engaged in truth and reconciliation, open memory, and right-to-know initiatives. However, in Doyle’s article for Unredacted, the Secretary of Peace defends his decision, admitting that “he was unsure what the government would do with the institution’s extensive digital archives, suggesting they may be transferred to the General Archives of Central America” among other government institutions. 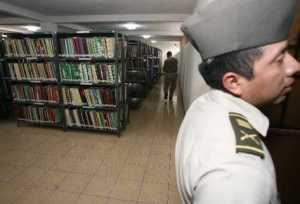 The Secretary told the press that the redistribution of the files is part of the broad restructuring of the government. Other professionals argue that while trust is a strong factor in determining the custody of records documenting wide-scale abuse, the argument should go further to state that is it the trust of survivors and victim’s families that is paramount. By all accounts, the commonly suggested alternative to government custody are grassroots organizations and other NGOs represented by survivors or those directly affected by the crimes. It is with great excitement that we announce the release of the first half of the proposal to form a U.S. Chapter of Archivists without Borders. This portion of the proposal, which includes Background and Mission Statement, will be open for comment until May 31, 2012. You can find the full text to these sections on our website: http://awbuschapter.wordpress.com/. To contribute your comments on these two sections, please use the comments feature on our website. We are currently working with Archives without Borders International to draft the remainder of the proposal. Please be patient as we work diligently to push these additional sections out for your input. As members of the archival community who have expressed interest in the vision Archivists without Borders promotes, your contribution is vital. The comments you make will shape the direction of this organization. We welcome your ideas for the organization’s potential, criticisms of the wording, alerts to unanticipated implications, and questions about how we currently envision this chapter functioning. We are also pleased to announce that you can now follow AwB-US on Twitter (@AWB_US) and on Facebook:http://tinyurl.com/8x4y3nv. 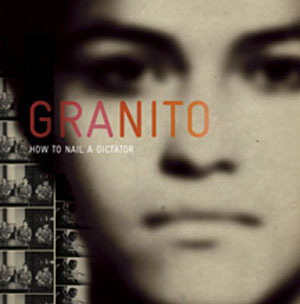 Granito, a documentary on the Guatemalan atrocities of the 1980s premiered last week at the Sundance Film Festival. I met the director, Pamela Yates, after a screening of her last film, The Reckoning, in New York for the 2009 Human Rights Watch Film Festival. At the time, we spoke about the role of archival footage in bringing justice to oppressed groups and individuals. Yates was traveling between the U.S. and Latin America at that time filming Granito. Yates’ documentary footage from a related 1982 film, When the Mountains Tremble, was currently being used to develop a human rights case for victims of the political and civil conflicts in 1980s Guatemala. 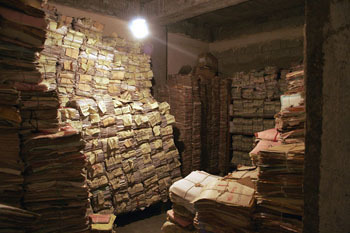 Because outtakes from this earlier documentary being used to develop cases against the Guatemalan state, Yates was given the unique opportunity to follow and document on film the subsequent unearthing of government archives which were used also used as evidence in the trials. Authored by archivist and Chair of the ICA’s Human Rights Working Group, Trudy Peterson, and in partnership with The Woodrow Wilson International Center for Scholars, this publication provides guidance to current and future commissions on managing their records once the work of a commission draws to a close. Because truth commissions vary from country to country, this publication does not claim to provide answers. Peterson states that “those emerge from the individual context in which the commission operates”. At the end of the last century, the “truth commission” emerged as a means of addressing the tumultuous violence that occurred in a country. There are many examples from Central and South America. A large mass of records and information flow through commissions in a short amount of time, usually to produce a report. It is most often the case that records of truth commissions (those created previously by other institutions, as well as those contemporaneously produced and used by a commission) are difficult, if not impossible, to trace. In keeping with the premise behind a truth commission, the records of such should eventually be made publicly accessible to ensure the transparency of the actions and decisions of the commission. Peterson stresses that this publication is not a list of comprehensive guidelines in managing the records while still in active use. Drawing from past and present examples, Peterson produces essential reading for assistance and insight into the proper disposition of the records of such commissions after they close. On October 28, 2010, two for mer Guatemalan police officers accused of the 1984 abduction and forced disappearance of Labour Party activist, Edgar Fernando Garcia, were sentenced to 40 years in prison. The indictments and sentencing were long overdue. Last week Kate Doyle, a Senior Analyst at The National Security Archive (NSA), and Daniel Guzman, a statistician with Benetech, testified as expert witnesses for the prosecution in the trial of ex-police officers, Hector Roderico Rios and Abrahan Lancerio. I was introduced to the Guatemalan National Police Archives and the contributions made therein by Kate Doyle, by way of award-winning documentary filmmaker Pamela Yates (Pamela was generous with her time in explaining to me her own projects which shed light on the atrocities in Guatemala). Doyle’s earlier assessment of the Death Squad Dossier a military logbook documenting the disappearances of Guatemalans during the civil war violence of the mid 1980s, provided the watershed moment that allowed families of victims to pursue collective legal action. 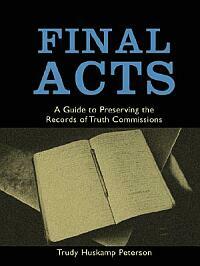 Doyle has been a committed advocate of truth commissions in Latin America for nearly two decades. Her work with the NSA, a long-standing partner of the Guatemala Human Rights Office, has brought justice by advocating openness in society and transparency in government. Doyle currently serves as advisor to the archivists of the Archives of the National Police in Guatemala. Another impressive feature of the proceedings was the testimony of statitician Daniel Guzman. Guzman is a consultant with the Benetech Human Rights Data Analysis Group (HRDAG). HRDAG performed a, sort of, records forensics analysis on a sampling of the records to produce a statistical analysis of the data in the records, which was then presented in court. The prosecution used the analyzed data to make it abundantly evident that Garcia’s disappearance was part of a systematic pattern of the state to eliminate opponents during the 1983-86 regime of General Oscar Mejia. HRDAG is a project offshoot of Benetech and it’s work exemplifies one of the novel ways archival records may be used in similar legal cases. Benetech’s purpose to apply technology in effecting change is strategic. They target three thematic areas in their work: Environment, Literacy, and Human Rights. The defend human rights by using information management to analyze records and provide technical assistance to other organizations, commissions, and groups to resolve conflicts and improve lives. HRDAG is a unique and promising amalgam of information management, statistics, and technology for the human rights movement. Their success in Guatemala, which made the arrests of the ex-police officers possible, may prove to have similar applications in places like the Congo where civil war fuels human rights abuses.